Serve and Grow in Eurasia! Catalyze your own walk with God as you help to plant new churches. Join us for all or parts of July 12-22, 2019 (or also July 17-29) to help launch a new church in the capital city of Tirana, Albania. Come by yourself or even better, put together a team from your church or neighborhood. You are uniquely qualified as a native English-speaker. 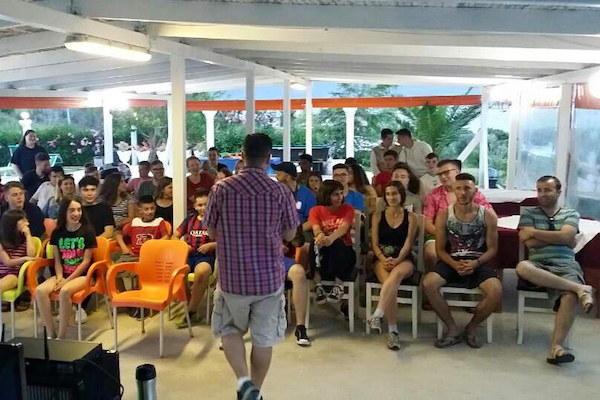 Albanian students and young professionals want to improve their English. They are interested in knowing you and open to hearing your stories of life and faith. CLICK HERE for a video from last year. CLICK HERE for a video that describes a similar camp from 2017. Help to plant a new church! Our church partner, Cru (Campus Crusade) has four churches in Tirana and has just planted another church near an important university. During the summer, high school students and university students love to go to the beach and they also love to practice their English. We will add energy and credibility to this new church plant that is fully led by the existing church. You will initiate relationships with unbelievers and church people that will continue into the future via social media and skype. The whole project is organized by our local church partner. We will serve them and they will lead us. Your team will be led by an American Eurasia Partners leader who has served in this part of the world for 25 years. There will be several others coming over for this special week. We will quickly form a team to serve the church and encourage each other. Because the church is organizing everything, we will be able to quickly form a team to serve them and implement their plans. $200 extra money for sightseeing, fishing trip, gifts for supporters, etc. It is best if your church helps you with tax-deductible receipts, but we can help you if you are stuck. Email to info@eurasiapartners.org to register or get more info.